Heirloom tomatoes are a true wonder of summer. It’s hard to imagine now, but when living in Russia, we had no other tomatoes but in-season heirlooms (often from our own garden) and saw that as nothing special. Just an order of life. Fresh tomatoes were only available in the summer, and canned to be enjoyed in the winter. When cut open, they smelled of the sun, appeared to be sprinkled with sugar around the seeds, and melted in the mouth, like butter. How things have changed. Nowadays, it takes some luck to get our hands on summer heirloom tomatoes. Especially in Florida, where the harvesting season is in the winter. When feeding my friends, even those who have never tried raw food before, I like to serve dinners that consist of simple raw dishes without announcing them as such. No one ever suspects anything out of the ordinary, aside from proclaiming the food better than ever. I’ve done this a few times and was always surprised by the positive and excited reactions of my guests. This lasagna is a great dish to introduce at such gatherings. It is fresh, light, fragrant, and incredibly colourful. It’s always said that the more colours you have on your plate, the healthier is your meal. This lasagna is just that, nourishing. It calls for some uncomplicated preparations the day before, takes little time to assemble, and is always a success. In a high speed blender, combine the thoroughly drained sun-dried tomatoes with the rest of the ingredients until smooth. In a food processor, blend all the ingredients until thoroughly combined, but still chunky. In a food processor, combine all the ingredients, except water, until thoroughly mixed. With the food processor on, gradually add the water, until the mixture becomes somewhat fluffy. Cut the stems off the mushrooms and discard. Briefly wash the mushroom caps, and quickly dry them with paper towels. In a bowl, mix the oil, lemon juice, and herbs. Thoroughly combine the marinade with the mushroom caps. Place them on a Teflex-lined dehydrator tray, and dehydrate for 2-3 hours. The best way to prepare this dish is to make the tomato sauce, ricotta, and pesto the day before serving. You can marinate the mushrooms ahead of time as well. All the prepared components store well separately, refrigerated in airtight glass containers. Slice the zucchini, tomatoes and olives right before serving. I like to use a spiral slicer for slicing the zucchini. It allows to arrange the lasagne layers in different shapes and sizes, such as round, or bite size, and helps the presentation. But you can also use a mandolin to thinly slice the zucchini lengthwise. Either way, put the sliced zucchini in a bowl, sprinkle with some olive oil, add a little chopped oregano, thyme, salt and pepper, and quickly toss. Start layering the lasagne with a slice of tomato if using spiralized zucchini, or with overlapped zucchini slices if using a mandolin. Arrange your layers in any order you like, alternating the sauces, ingredients, and colours. I usually spread the tomato sauce on top of each zucchini layer, then top it with dollups of ricotta and pesto, and cover it with a tomato slice or a mushroom cap. To finish off, I like to top the lasagne with brilliantly green Castelvetrano olives. I enjoy making individual lasagne, using up the ingredients as I go. But you can prepare one large lasagna in a baking dish. Again, it’s better to store all the leftover components separately, rather than in the form of a prepared lasagna. Although it’s still going to taste good the next day, it won’t look as great. I never thought I could love tomatoes more. 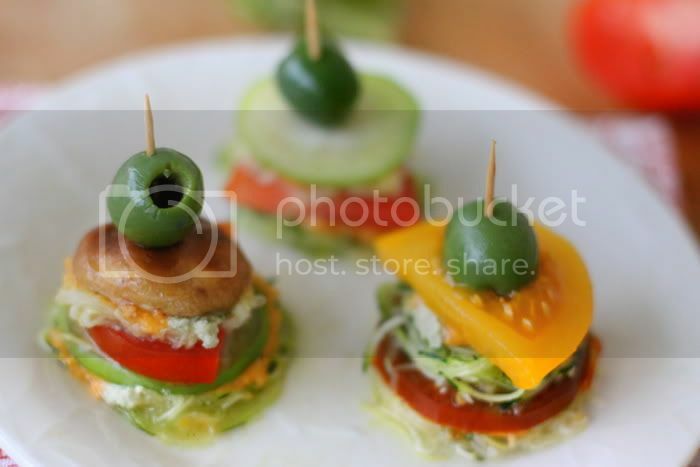 Scenery – spectacular, recipes – mouthwatering! Not announcing it’s raw – sometimes necessary. Brilliant idea. As always a truly awe inspiring post. Your photos always highlight the beauty of the amazing fresh ingredients. Looks so fresh and colorful! Wow – the colors are gorgeous! 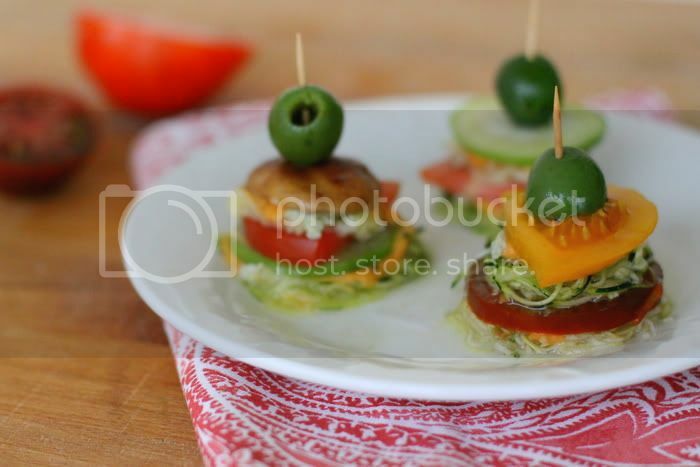 What a great use for in season heirlooms! 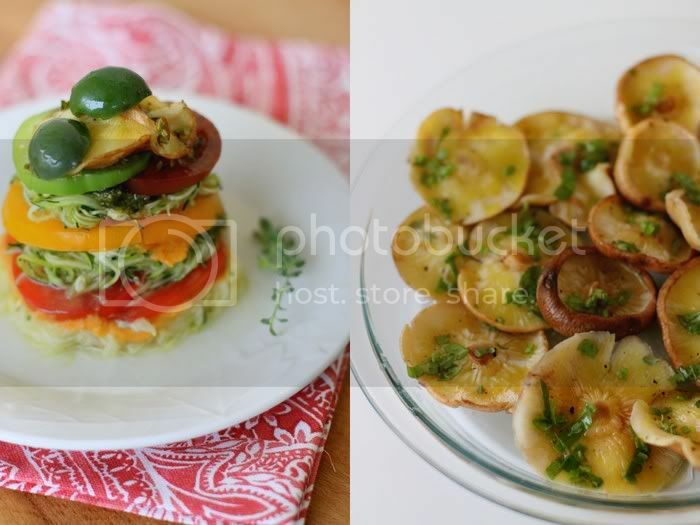 These photos are gorgeous and the lasagne looks absolutely delicious! Beautiful pictures!!! 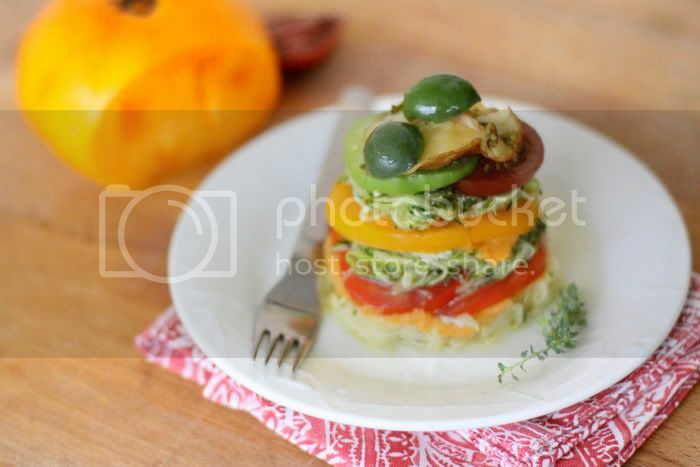 Love the freshness of the recipe..You have a lovely blog! Looks both beautiful and scrumptious! Oh my gosh does that ever look delicious!!!! Oh my gosh does that ever look delicious!!!!!!! Ooooh ,..WAW!! what fantastic looking stacks of fine foods! MMMMMMMMM,..I love your special flavours in here,…beautifully combined! I bet it taste as good as it looks! This is so pretty! The colors are fantastic. I have many vegetarian friends who would love this! 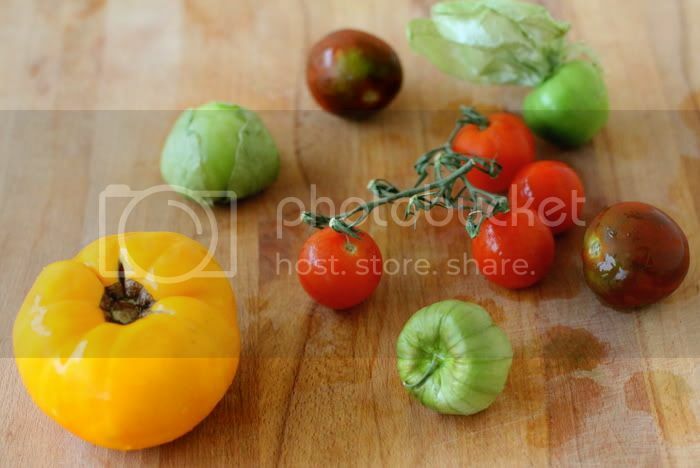 Lovely, indeed: from the photos to the colorful and vibrant heirloom tomatoes. Thanks for sharing! Sassy Kitchen: You’re so welcome and thanks! Susanna: You’re too kind :) Thanks! Sue: We missed you! Thanks so much. Emily: Great and thank you! What a beautiful dish! It looks gorgeous! I’ve been wanting to try some raw food. love love love this dish! We have several heirlooms in the fridge from a local farm and I don’t dare cook them! They are just to perfectly sweet to not eat raw. This recipe is a keeper….I think I will try it tonight! Hi, I recommended your blog for 2010 Blog Day. The entry is on my main blog, not on the vegetarian one. Wow, loved the colors and veggie galore! My type of food! Your pictures seems to real and amazing! Now I am off to buy some heirloom tomatoes. Adelina: Thank you! This is a great dish for a raw food first. Coco: Thank you! I hope you liked it. Ania: Thank you so much! oh my yumminess…you’re such an inspiration…your blog posts are just so beautiful! always make me smile! Nelly: Thank you very very much!!! I see in your about page that you hope to start an online shop or cafe – I hope you realise your dream soon – you are very talented!